During either player's turn, when your opponent activates a Spell Card that includes an effect that Special Summons a monster(s): You can Special Summon this card from your hand. If Summoned this way, while this card is face-up on the field, any card sent to the Graveyard is banished instead. 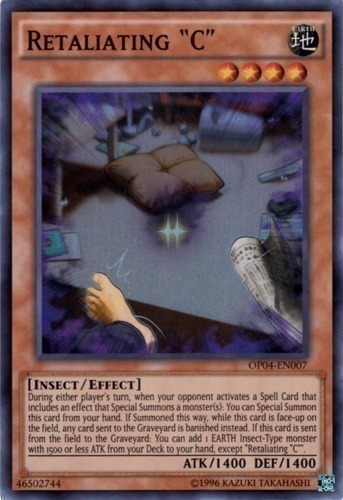 If this card is sent from the field to the Graveyard: You can add 1 EARTH Insect-Type monster with 1500 or less ATK from your Deck to your hand, except "Retaliating "C"".